Encountering Elitism: Do You Deserve This Music? Goalie Rachel Tannenbaum ’15 registered her fourth shutout of the season against Babson and made 22 saves in the loss to Bowdoin. The Jeffs took four out of five games in a long stretch of away games over the past week and a half, defeating Williams, Babson, Colby and Smith and dropping one to Bowdoin. “Playing on the road is definitely a different experience, but we took it one game at a time and didn’t think of it as a five-game stretch,” co-captain Stephanie Clegg ’12 noted. The Jeffs defeated the Ephs 3-0 on Friday, Oct. 7. Katie McMahon ’13 led the Jeffs with two goals, while Chrissy Cantore ’12 netted the third. Cantore started things off in the ninth minute when she rebounded a shot from Carly Dudzik ’12 on a penalty corner and tapped it into the net. The Jeffs then took advantage of a penalty corner awarded with no time left in the half when Sarah McCarrick ’12 took a shot, which McMahon redirected into the goal. While Williams challenged Amherst with a series of shots in the first 10 minutes of the second half, first-year goalkeeper Rachel Tannenbaum anchored the Jeff defense with five saves on the day. Quickly thereafter, sophomore Krista Zsitvay and McMahon went on a fast break; Zsitvay fed McMahon a quick pass, and she went one-on-one with the Williams goalie to tack on the team’s final goal of the game. Amherst then blanked Babson last Wednesday, taking a decisive 5-0 non-conference win on the road. Notably, Zsitvay contributed a hat trick in the game, paired with goals from Alex Philie ’13 and McMahon. Tannenbaum registered her fourth shutout of the season. 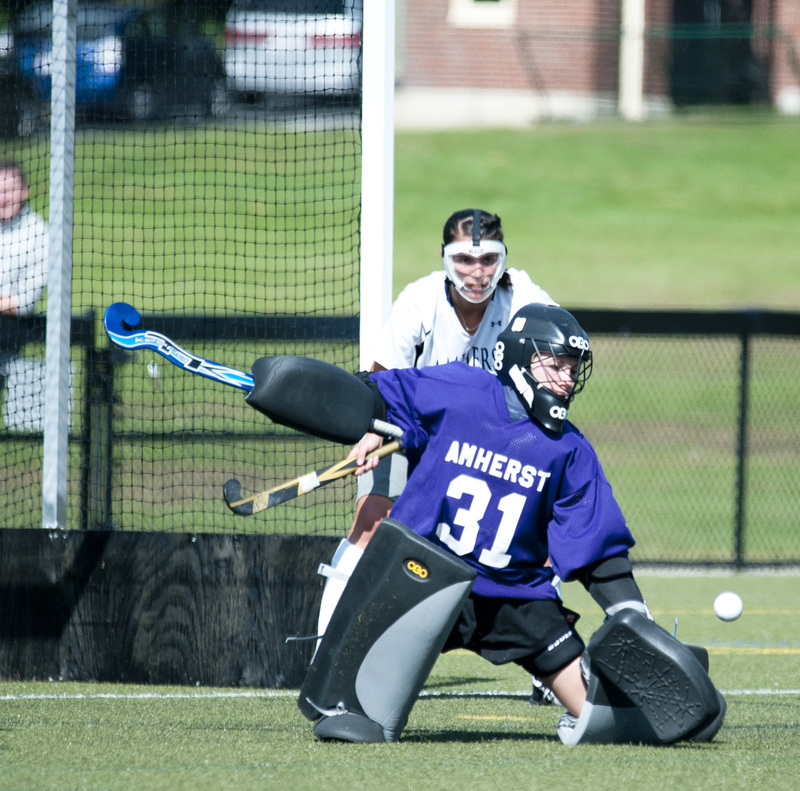 This weekend, Amherst traveled to Maine to take on NESCAC opponents Colby and Bowdoin. On Saturday, the Jeffs defeated the Mules 4-1 and coach Knerr earned her 100th career win. Cantore struck first in the sixth minute, assisted by McCarrick and Zsitvay. Colby’s Caitlyn Lancaster quickly answered a minute later, making the score 1-1. At the 11:08 mark, McMahon tacked on the team’s second goal, fed by Cantore. Eight minutes later, McMahon registered a third goal (her career 11th), assisted by first-year Ellie Andersen. Finally, early in the second half, McMahon orchestrated a corner where Dudzik passed to McCarrick, who shot the team’s fourth and final goal into the net. Amherst moved onward to Bowdoin on Sunday in a gripping game that decided who would take the top seed in the NESCAC. After the game was sent into two overtime periods, Amherst fell to Bowdoin 2-1 in penalty strokes. Bowdoin applied pressure from the beginning, registering several quick shots on goal and eventually scoring in the 19th minute when Katie Herter redirected a loose ball into the goal. Amherst would answer in the second half when McMahon fed McCarrick to convert a penalty corner into a huge goal that tied things up. The teams remained deadlocked for the remainder of regulation, largely due to a solid Amherst defense countering Bowdoin’s offensive force. Even after two 15-minute overtime periods, the score remained 1-1. Throughout both overtime periods, Bowdoin held an edge in shots and corners, 13-3 and 10-4, respectively. But while Bowdoin beared down, Tannenbaum’s formidable peformance in net kept the game close; she contributed 22 saves in the game. When it came down to penalty strokes, Amherst made two of their four attempts, and Bowdoin made three of four before Katie Riley netted Bowdoin’s fifth and finally ended this extremely close matchup. The Jeffs finished up their road trip by taking it to Smith 8-1 on Thursday. In Amherst’s smattering of goals, Zsitvay contributed two, Dudzik added two, Madeline Tank ’15 scored once, and Philie rounded out the offense with a hat trick. McMahon tallied another assist, bringing her career total to 27, which ties the school record. Amherst now stands at 10-2 (6-2 NESCAC) and will face Smith away on Thursday before hosting Wesleyan on Saturday for Homecoming.